This entry was posted in My Photos and tagged daffodils, flowers, narcissus, photography, spring, spring cheer, spring flowers. Bookmark the permalink. Oh, how lovely! Our daffys are up now and seemed to be awaiting our homecoming. They are the happiest sign of spring. Thank you, Dor. I agree, how nice they waited for you to get home! Things must be greening up nicely there! …and it will be September before I see them down here! In the mean time I am enjoying some blooms of Cooktown Orchids. Yes, you are going into autumn now. Those orchids are such a lovely shade of pink! Do you like the cooler weather? What are your autumn flowers? We have asters and chrysanthemums. Do they grow there? Awesome picture. This is the color I needed tonight! Thank you, Kim, so glad to hear that! Love them & the shot! Beautiful, warm colors. Very dreamy! We are packing up our house in Indiana and there is one daffodil braving the cold and blooming. I will enjoy it now, because I think they are a ways away in Wisconsin! You’re going from cold to colder! Bucking the trend, eh? 😉 I hope you and Choppy will love the new environs! I think she’ll love the environs more when we get a house, rather than our apartment! And it was a beautiful day here. I think it was a tease, though, and it’s going to get cold (-ish) again soon. The daffodil has to be the definition of yellow! My daffodils are nearly finished for the spring. They always surprise me when the pop up, even I’m the one who planted them! I really enjoy being surprised this way. What a wonderful element to have in a garden: surprise! Not as easy to achieve as one might think! Thanks, Judy. I know you are sharing this feeling! So delicate and feminine. Lovely. Thanks, Julie, and the same to you! Thank you, Robin! They were such a happy gift right when I needed it! For a split second I thought “oh! Eliza’s daffodils are up!” and then came to my senses. But it won’t be long now, girl! I loev this composition! So cheery. 🙂 Thanks, I do love the way daffodils uplift right we need it so badly! 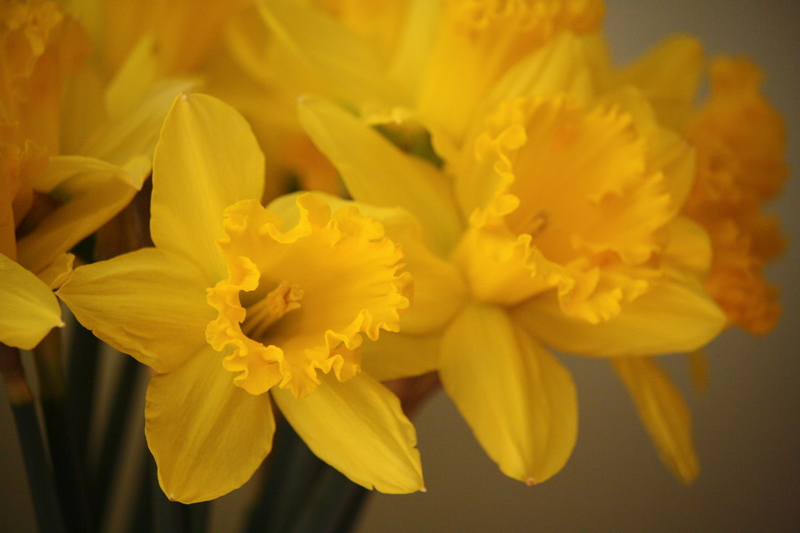 I love daffodils and your photo just captures their simplicity and beauty. Thank you so much for visiting and commenting. Much appreciated! Ah, yes. So much to love here. Warm and sunny….I can almost smell them. 😉 Thank you! Blessings and hugs! Happy sigh! These always bring a smile, don’t they? In your photo they glow so warmly. Thank you, Melissa. Yes, they do make me smile! Absolutely beautiful! Perfect aperture for limited focus and great soft light.